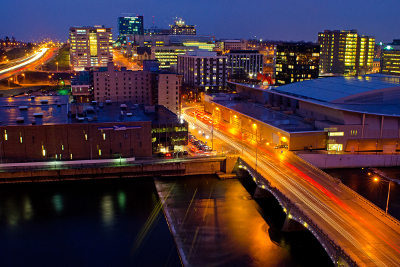 A weekend getaway to Grand Rapids leaves you wanting more. There are so many wonderful things to do that you will be hard pressed to fit it all in. So you will probably want to plan another trip again soon. 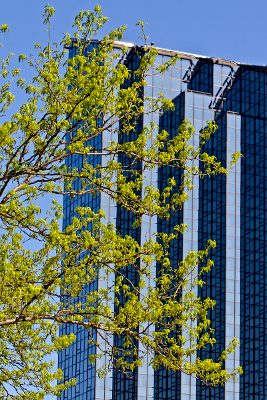 Start your excursion with a stay at the Amway Grand Plaza Hotel. According to the Amway Grand website, "During your stay at the Amway Grand Plaza, you'll experience the timeless beauty of the early 20th century alongside today's contemporary styling. All 682 guest rooms are generously appointed, featuring thoughtful amenities for your comfort and enjoyment. So no matter which room you choose, it's sure to be a visit you'll always remember." Truly, this hotel is a destination. From the moment you walk through the door, you will be immersed in elegance and gracious service. Be sure to linger during a stroll through the Pantlind Lobby and enjoy the classical architecture. Rooms are available within the Pantlind or in the tower at the Amway Grand. Classic rooms in the tower have amazing views of the Grand River. Other rooms feature vistas of the downtown. 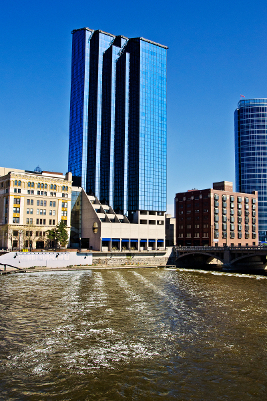 After checking in, take a short walk to the Grand Rapids Art Museum, commonly referred to as the GRAM. Spend a morning walking around the downtown. Discover a cozy breakfast spot called the Sundance Grill where the food is delicious and priced right for a family. Take a tour of Kendall College of Art & Design, a school dedicated to "help emerging artists and designers to develop, explore and unfold their potential." Another short walk to the west bank of the Grand River brings you to the Grand Rapids Public Museum. Spend a few hours immersed in a tour of the museum which has many exhibits including "Streets of Old Grand Rapids" which is a stroll through a full-scale detailed re-creation of Grand Rapids in the 1890s, and "The Furniture City" which is the museum's largest and most-studied exhibit presenting a complete history of furniture manufacturing in West Michigan. Before leaving the musuem, treat yourself to a spin on the authentic 1928 Spillman Carousel, complete with delightful horses and a fully functional band organ. While at the Grand Rapids Public Museum, visit the Roger B. Chaffee Planetarium and enjoy a seasonal sky show. The planetarium is also popular for the late-night laser light shows of classic rock accompanied by dazzling visual effects. 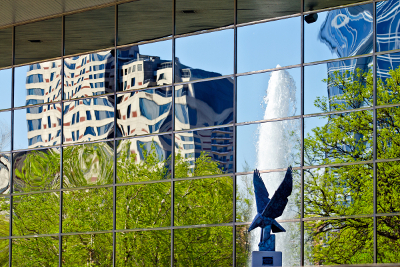 After freshening up and having a bite to eat, take the enclosed Skywalk to the DeVos Place, a Grand Rapids convention center, home to a full slate of events throughout the year. After walking all day, take time to relax, by enjoying a dip in the Amway Grand swimming pool along with a nice soak in the hot tub. After breakfast the next day, drive just a few miles to the Frederick Meijer Gardens and Sculpture Park where the Butterflies are Blooming in the spring in the 15,000-square-foot Lena Meijer Tropical Conservatory. Take a narrated tram tour around the sculpture park and learned about the sculptures and artists from our guide. This makes for a very full weekend, but just a small glimpse of West Michigan's favorite city. For help planning your getaway, start with the Grand Rapids Convention & Visitors Bureau website and then get ready to have some fun!